Does idealism, rather than pragmatic realism, inhibit good policy outcomes? That was the subject of a thoughtful post in the New Statesman by Ian Leslie, published in the wake of Jeremy Corbyn’s statement that he would refuse to use Britain’s nuclear deterrent (and indeed get rid of it). It is mistaken, and unhelpful, to assume there is some kind of simple choice between a nuclear-free world, and a world with nuclear weapons. Because the choice is not this simple. In reality, we live in a world in which nuclear weapons cannot be uninvented, and even if we we did manage to eliminate all weapons from all countries, we would still be living in a state of constant readiness, with what Leslie terms ‘latent’ nuclear powers able to produce and arm nuclear weapons at very short notice, even if they don’t actually physically possess them – a state of affairs that, pragmatically, isn’t actually all that different from the world today. Refusing to use nuclear weapons, and destroying our arsenals, does not solve the essential root problem of humanity’s basic ability to produce these weapons. Policy must deal with that reality, rather than clinging to an idealistic position which pretends getting rid of physical nuclear weapons would remove the potential for nuclear conflict. I don’t really want to get into a discussion about the merits of this argument about nuclear weapons (which admittedly I find persuasive); but I do want to discuss the striking parallels with some aspects of cycle campaigning and road design, and how that campaigning should respond to arguments about the function of roads and streets, and cycling’s place in them. It might seem to be a bit of leap to jump from nuclear policy and cycle campaigning (!) but bear with me – the link here is something called the Nirvana Fallacy. In a paper from 1969, the American economist Harold Demsetz distinguished between two approaches to public policy: the “nirvana” approach, and the “comparative institution” approach. The former presents the choice as between an ideal norm and the imperfect existing arrangement; the latter as between alternative, real world arrangements, imperfect and less imperfect. This is colloquially known as the “nirvana fallacy”: the tendency to assume that there is a perfect solution to a problem. A politician who uses the nirvana fallacy gains an easy rhetorical advantage. He can paint inspiring pictures of his perfect world, and attack the existing state of affairs for not living up to it. He can accuse anyone who doesn’t accept its plausibility as cynical, lacking in vision, or principle. But this advantage comes at a cost, because the nirvana fallacy makes you stupid. It stops you from doing the hard, gritty thinking about how to improve the world we have, since, faced with a series of complex, imperfect options, you overleap them to reach the sunlit uplands of an ideal scenario. Soon, you forget how to think about the real world at all. How does this relate to road design? Well, the ‘Nirvana Fallacy’ is really a pitch-perfect description of an attitude to road and street design that is aimed at some distant (and almost certainly unattainable) ideal, while disparaging other forms of road design for failing to live up to that hypothetical ideal. There are different forms of this position; one of them is the ‘No Surrender’ ideology that has problematically dogged British cycle campaigning since the 1930s; an attitude that maintains motor vehicles are interlopers on Britain’s roads, and that separate provision for cycling alongside those roads or streets represents a ‘surrender’ of that environment to motor vehicle dominance. Here, a choice is presented between the current state of affairs, and a Nirvana in which the roads are somehow ‘reclaimed’ for cycling, a Nirvana that can never realistically be attained, and that inhibits sensible and constructive thinking about how to design cycling as a mode of transport, available to all, into the modern street environment. Another form – and perhaps more prominent today – is a street design philosophy that objects to the presence of cycling infrastructure on roads, on the grounds that it diminishes the value of ‘place’. This might take the form of ‘placefaking’ – alleging that your road is now a ‘place’ because it has beautiful paving, even though it carries the same large volume of motor traffic as it did before, and that because it is a ‘place’, cycling infrastructure is unnecessary. The implication is that cycling infrastructure interferes with ‘place function’; that the very idea of providing a specific portion of road space for cycling is against ‘place’. A moment’s examination reveals that this is actually a deeply strange position to hold – consider how it is never aimed at roads and streets that have designated areas for pedestrians (that is to say, pretty much everywhere). Does ‘carving up’ street space, and reserving it for the specific use of walkists, destroy a sense of place? An equivalent street in Rotterdam, with designated space for cycling as well as walking. No ‘place function’? Despite its strangeness, this incoherent ‘place’ argument features prominently in Guardian blogger Dave Hill’s recent ‘recycling’ of a blog by Hackney councillor Vincent Stops. 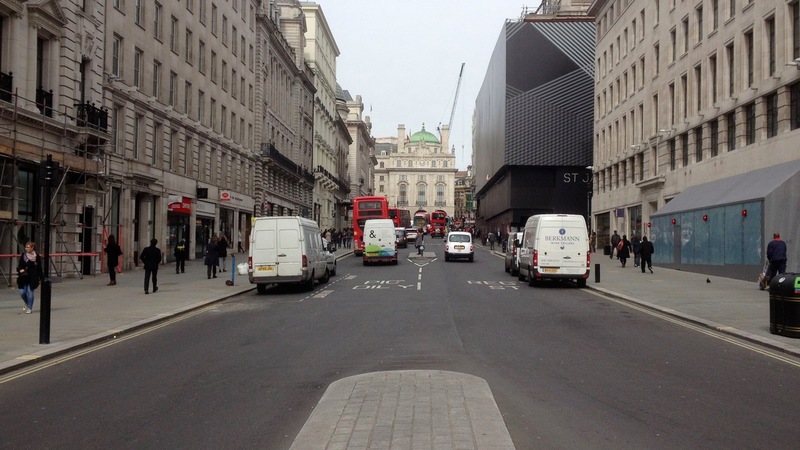 Should London’s streets be designed for facilitating traffic movement, or enhancing them as attractive places? The right answer is generally some variant of both, and takes different forms according to the type of street and the priorities of the people making the decisions. Running implicitly through the piece (which of course borrows its logic from Stops’ blog) is an assumption that ‘place function’, ‘attractive places’, ‘truly living streets’ – whatever we want to call it, is incompatible with cycle-specific design. Building cycling infrastructure somehow converts roads and streets into being all about ‘movement’, rather than being all about ‘place’, even if space is being taken away from motor traffic and reallocated for cycle transport. 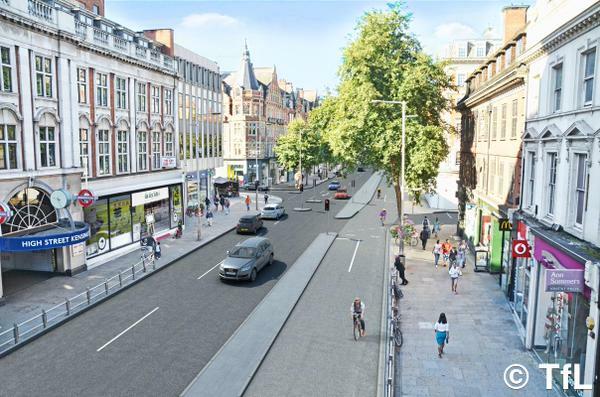 Witness how Stops glowingly describes Kensington High Street – a four lane conduit for motor traffic, polluted and choked, with (crucially) no cycling infrastructure – as an ‘exemplar street scheme’, that emphasises ‘place’. The regeneration of Kensington High Street changed how we looked at our streets – ‘place’ became as important as movement. The more progressive local authorities followed the example of Kensington High Street. They cleared the clutter on the streets and footways, so that pedestrians did not have to dodge around obstructions of all sorts, they widened pavements, introduced single-stage pedestrian crossings and used high quality paving. They recognised that creating streets and places where people wanted to be was as important as seeking ever more effective movement corridors. However, creating movement corridors for cycling has emerged as a new priority and we are at risk of forgetting how important great streets are. 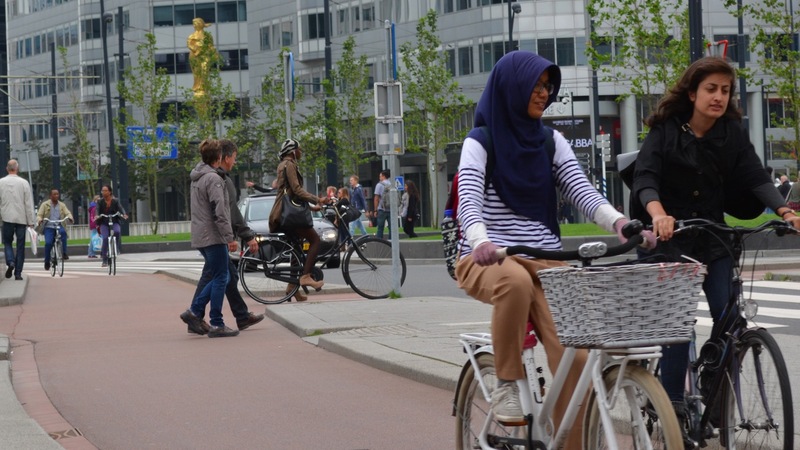 The cycle bloggers, cycle safety campaigners and friendly cycling journos have promoted a world view in which liveability has come to mean cycleability. Stops’ position is effectively that reclaiming road space on, for instance, Kensington High Street from motor traffic, and reallocating it for cycling, would actually diminish the place function of this road. Indeed, the visualisation below (which reduces four lanes of motor traffic to two, and adds two-way cycling infrastructure in its place) has been ridiculed by Stops. A TfL-produced visualisation of what Kensington High Street could have looked like. The implication is clear – roads that carry large amounts of motor traffic can be ‘places’, but the moment some of that motor vehicle space is repurposed for cycling, suddenly the road is all about ‘movement’, rather than ‘place’. Put this simply, it’s hard to take such a strange argument at face value. In fact, it is so incoherent that there is almost certainly something else going on behind it. And it’s the Nirvana Fallacy. ‘Nirvana’ in this context obviously isn’t the nuclear-free world of the example we started with; instead, it is a world in which all roads and streets, everywhere, don’t require any of that pesky cycling infrastructure, because they have all been turned into idylls of ‘place’. ‘Places’ where there is next to no motor traffic, and what motor traffic there is trundles along slowly, driven respectfully and cheerfully. Cycling infrastructure doesn’t fit in with this vision; it carries with it the implication that this Nirvana will never be achieved. Roads with cycling infrastructure are less than perfect. false dichotomies of perfect versus good shut down serious thought. The problem here is that the choice is not between the current state of affairs in British towns and cities, and those same towns and cities with ‘perfect’ streets with low levels of slow motor traffic – ‘Nirvana’ streets where everyone gets along with everyone else, regardless of their mode of transport. Instead, it is between the present reality, and a workable and achievable vision of the future. That workable future is the system that is currently in place in the Netherlands, and which London has started, very slowly, to inch towards. A system in which motor traffic is largely displaced from access roads, but that crucially involves physical separation for cycling on those main roads that still function (and have to function) as through-routes for motor traffic. The borough of Hackney – quite rightly – places a great deal of emphasis on the filtered permeability technique. It’s a simple and easy way of creating a comfortable cycling environment. The only motor traffic remaining on streets that have been ‘filtered’ is that which is accessing properties in the ‘filtered’ area. Not only is motor traffic greatly reduced, but what remains is not in a hurry to get anywhere else. Filtering turns streets into genuine places. But unfortunately (and importantly in the context of this discussion) this technique has a limit. You can’t apply filtered permeability on every single street, because that would mean that motor vehicles wouldn’t be able to get anywhere. Cities and towns would be entirely free of motor vehicles – perhaps a genuine Nirvana. But this is never going to happen. Buses need to move through towns and cities. Deliveries need to be made (for those essentials that can’t be delivered by cargo bike, or that are impractical to deliver by cargo bike). And trips by private motor vehicle are in many cases ‘essential’; or more specifically, not so inappropriate that they should be completely outlawed. Picking up furniture, or large amounts of shopping. A family trip to the seaside. Taking someone to hospital. And so on. Cars make sense for many types of journeys, and indeed, more generally, I don’t think any particular trip by motor vehicle should be wholly restricted. That’s just bad policy. We should instead concentrate our efforts on making the alternatives (in particular, cycling) much more attractive than they are now; a positive approach to attaining the same outcome. The routes for this kind of motor traffic that is never likely to be eroded – buses, deliveries, ordinary car trips – will have to follow a ‘Motoring Grid’, main roads that will at the same time require cycling infrastructure in order to make cycling a safe, comfortable and attractive experience for ordinary people. Without it, anyone who wishes to cycle will have to mix with buses, lorries and the general motor traffic that would still exist, even at very low levels. And we know that most people don’t want to cycle in these conditions. Observation of the real world shows that bus lanes are not chock-full of children or elderly people cycling; bus lanes are only tolerable as as a cycling environment for a pretty narrow demographic. And research is confirming that what had until quite recently been considered as ‘cycle provision’ really isn’t attractive or safe enough for most people. We know the kinds of conditions under which people will consider sharing the carriageway with motor vehicles while cycling, and it involves genuinely low motor traffic levels, below 200 vehicles per hour at peak, combined with a (designed) low speed environment. These are not conditions that are likely to be achieved on main roads in urban areas; the flow of motor traffic will be too high, and even if it is very low, it really doesn’t make sense from a strategic point of view to lump bus transport into the same space as people cycling. 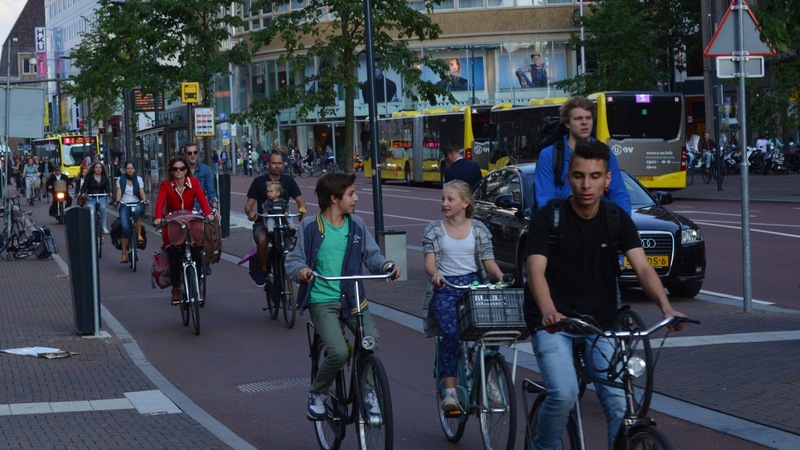 Buses separated from cycling in the Dutch city Utrecht, on a road where private motor traffic has been eliminated. Mixing buses in with dense cycle flows, travelling at around 10-15mph, does not make for a sensible bus network – to say nothing of the effects on the quality of the cycling environment. Of course, it’s very easy to criticise roads that have cycling infrastructure for being less than perfect than some mythical Nirvana where ‘place and movement are in balance’, or some other guff. (To repeat, this objection isn’t ever levelled at streets that have pedestrian infrastructure). But the choice isn’t between perfection, and roads with cycling infrastructure. Instead the choice is between busy main roads that are designed in a way that enables cycling for all, and busy main roads that do not. It’s that simple. Talking about ‘shifting the balance in favour of place rather than movement’ on these kinds of roads, by failing to provide cycling infrastructure and opposing it where it is being constructed, really amounts to empty rhetoric, an airy wafting in the direction of Nirvana, but without any concrete strategy on how to attain it. It avoids dealing with reality. The nirvana fallacy makes you stupid. It stops you from doing the hard, gritty thinking about how to improve the world we have, since, faced with a series of complex, imperfect options, you overleap them to reach the sunlit uplands of an ideal scenario. Soon, you forget how to think about the real world at all. Regarding Kensington High Street, where he described the proposed cycleway as a “movement corridor for cycling” conveniently ignores the fact that most of the width of that street is currently a movement corridor for motoring (with the remaining portion being a movement corridor for walking of course). I assume he’s okay with railways being “movement corridors for trains”, and bus lanes being “movement corridors for buses”. It seems he’s perfectly happy with “movement corridors” for all modes of transport except cycling. I’m not sure his position is even a case of the nirvana fallacy, as it doesn’t seem to make sense even on that level! Indeed. I think it’s mostly because he’s completely eccentric—as eccentric as a March hare, in fact. There’s little point expecting logical consistency or trying to hold a sensible discussion with someone this eccentric. His missus is just as bad. Having sat through the recent AGM of their local branch of LCC (admittedly, with earphones in and listening to radio programmes), it’s clear that they’re far from being the only ones in that part of the world. I’m becoming more and more convinced that it’s attributable to the specific cocktail of motor traffic fumes and [passive?] `funny cigarette’ smoke they all breathe day-in-day-out! Stops’ praise of Kensington High St is mind boggling. As mentioned, the street is a polluted, congested traffic sewer and the changes there are purely superficial. Stops also describes local authorities doing this type of scheme as “progressive” which shows that his ideology can create some strange political bedfellows. Stops, a Labour councillor, thinks that the Conservative controlled Royal Borough of Kensington and Chelsea are progressive…. hmmm… I suspect that RBK&C motivation for preserving the dominance of motor traffic is they don’t want to annoy their rich, car-owning residents. Dave Hill’s role as a sock puppet is also somewhat cynical. Hill will know these sort of articles are good click bait from and Hill has his own ideology which is to be against anything that Boris Johnson does. Another clear-sighted article Mark. I really hope that the Dave Hill’s of the world would take it’s lessons on board. p.s. I appreciate the thrust of the article isn’t actually about nuclear weapons policy at all, but it’s probably worth noting that resistance to Trident isn’t necessarily to the concept of a nuclear deterrent nor indeed a simple dichotomy between a “nuclear/no nuclear” world – but merely a pragmatic acceptance that there’s a big question mark about the usefulness or practicalility the *UK’s* nuclear deterrent *specifically*. In other words: “Does the UK have a credible nuclear deterrent?”; I would suggest the answer is “No”. Argh! should be “its” – blooming grocer’s apostrophe! First time I’ve heard of the Nirvana Fallacy and it’s so apt. I read somewhere that real city progress can be seen in places that have well-developed mass transit and cycling/pedestrian road systems. But not everyone will obviously agree to that because of the concerns (some of which are valid, might I say) about the need for motorized vehicles. So I guess an ideal infrastructure (where everyone’s happy) will almost be impossible to design. Finding the most practical, albeit not faultless, solution should be the direction. Incisive analysis. 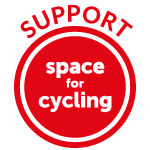 We have heard time and again arguments favouring carving out some safe attractive space for cycling on UK streets countered with Nirvana themes such as, ‘you can’t have segregation everywhere’ or ‘Dutch cyclepaths haven’t reduced car use to zero’. We can make a difference – indeed we are beginning to make a difference – and that is what counts now in our real world. Further to what you’ve said above, what is also not often talked about is the evolving nature of streets. You might start with a 4 lane road, then put in cycle tracks by removing one lane – which encourages a change to the way the street is used; followed by making it one way for motor traffic with loading bays and wider cycle tracks, and then end up being able to make it an access-only road with extremely low levels of motor traffic use, tasteful granite paving and only slight height differences (which might meet Stops’ vision of perfection). Big changes rarely happen in one full step. Quite right – this is actually often the evolutionary history of Dutch roads and streets. The cycling infrastructure was the first step towards further progress; not only does it remove space for motor traffic, it visually demonstrates the large numbers of people using a road or street by bike, which makes it easier to restrict through traffic at a later date. In fact, this is exactly what is (hopefully!) going to happen with the Tavistock Place route; progress started with cycle tracks is going to evolve to a route which eliminates through traffic. Not your best article. It confuses and mixes things. And the Nirvana Fallacy argument is a typical #NastyBritain argument for not taking courageous actions. When will British people understand that violence begets violence? When will they understand that the reason Britain is a constant target of “terrorists” is that it is attacked as a response for its violence against innocent people? When will they understand that the UK is less safe with nuclear weapons than without? I understand that this is a country whose wealth was obtained through violence and theft; but come on, are you going to remain hooligans for ever?